Louis C.K. announced his $1 million sales milestone during a chat with talk show host Jimmy Fallon. NEW YORK (CNNMoney) -- Comedian Louis C.K. was annoyed that he never saw a royalty check from sales of his standup specials through traditional outlets like DVD or iTunes. So he produced his own recent special, sold it online directly to fans for $5 -- and made a cool million in just 10 days. Louis C.K. announced the sales milestone on Wednesday night's episode of "Late Night with Jimmy Fallon." Louis C.K. began selling the special, filmed at New York's Beacon Theater, on December 10. He put up a simple website that directed customers to "buy the thing" through eBay's (EBAY, Fortune 500) PayPal for $5. A footnote explained that the file has "no regional restrictions, no crap. You can download this file, play it as much as you like, burn it to a DVD, whatever." Louis C.K. called it an "experiment" when he launched the sale. Wednesday's $1 million milestone showed that it's paying off. Jimmy Fallon asked: "You just said 'Hey, everyone who wants to see the show, you give five bucks'?" Louis C.K. paid to produce the special "out of my own money," he responded. "So I had it. And I said, I can just give it to people for a little bit of money." A friend told him "everyone's going to steal it...so I just wrote a note that said, you know, please don't do it," Louis C.K. said, as the audience laughed. "And they didn't. So it made a lot of money." Louis C.K. said he was shocked as he watched the orders come in -- and then began to feel guilty about the amount he'd netted. "I've never had a million dollars all at once. I grew up pretty poor and I was like, this is not even my money," he said. "This is just a five-dollar impulse that 220,000 people had, and now I have it. And I felt uncomfortable about having that much money." So Louis C.K. set aside $250,000 to cover the cost of the expenses of producing the special, then doled out another $250,000 in bonuses for his staffers. He then donated $280,000 to five charities: The Fistula Foundation, The Pablove Foundation, charity: water, Kiva and Green Chimneys. "I was going to [donate] $100,000, but it's like blackjack -- I just kept dishing it out," he told Fallon. That leaves $220,000 left over. "Some of that will pay my rent and will care for my childen [sic]. 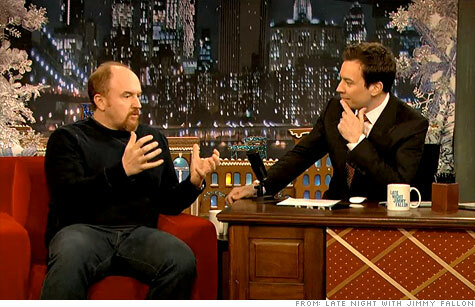 The rest I will do terrible, horrible things with and none of that is any of your business," Louis C.K. wrote in a statement posted on his website. A $220,000 profit is plenty, he added. "I never viewed money as being 'my money' I always saw it as 'The money.' It's a resource. if it pools up around me then it needs to be flushed back out into the system," he wrote. "If I make another million, I'll give more of it away." Is Apple's answer to TV's big problem hiding in plain sight?